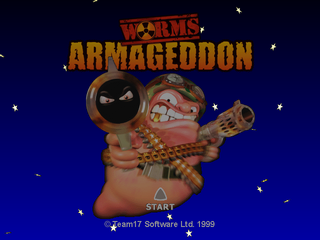 Worms Armageddon is an entry in Team 17's Worms series of games, and was released among other platforms for the Sega Dreamcast in 1999. It uses an enhanced version of the engine seen in Worms 2, though the gameplay differences are not significant. It was followed by Worms World Party in 2001, which added a few more features, including online multiplayer. Main article: Worms Armageddon/Magazine articles.